I was never into the Mad Max franchise growing up. I was simple never exposed to it and thus never went looking for it. My husband on the other hand enjoyed them and was very excited to see Fury Road. And I must say, I’ve been hooked ever since. Immortan Joe is deliciously evil in appearance as well as actions. He’s a guy you definitely would not want to find yourself alone with. Around the time of the end of civilization Immortan Joe was known as Joe Moore. He was a Colonel in the Australian Army, having fought in the Oil Wars and emerging a Hero of the Water Wars. He quickly found himself the highest-ranking officer remaining in the entire Army and took this to his advantage. From here he decided to grow his support and rebuild his ideal civilization. He was renamed Immortan Joe due to his great age and seemingly impossible survival skills. By the time of the film he is obviously in poor shape, which is ironic since his strict War Boy Policy states, “If you can’t stand up, you can’t do war.” And if you notice, he often has trouble walking without assistance from his son Rictus Erectus. Actor, Hugh Keays-Byrne made his Mad Max debut 36 years prior in the original 1979, Mad Max as Toecutter. 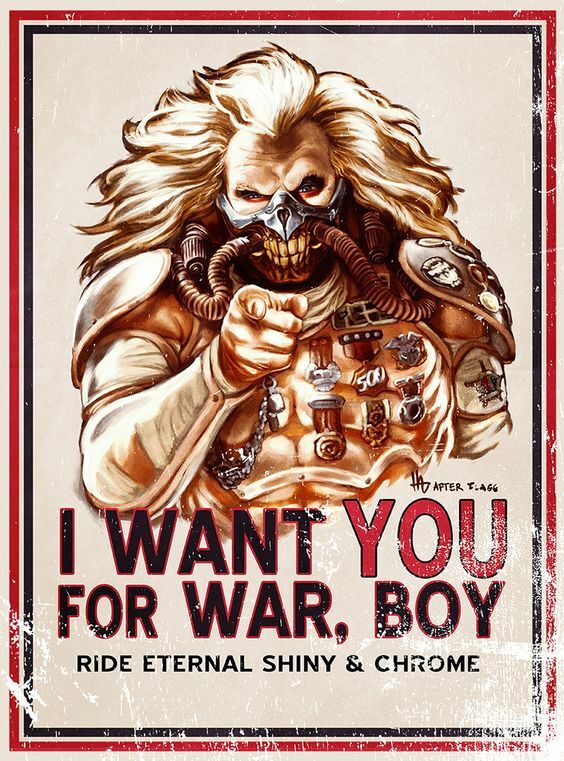 In an interview, Hugh Keays-Byrne stated that when the War Boys spray their mouths silver and say it will allow them to enter “the gates of Valhalla, shiny and chrome”. This is not so much a religious experience but as an actual drug experience. When the War Boys spray the silver paint into their mouths they’re inhaling “a very euphoric drug that keeps the War Boys high and suicidally devoted to Immortan Joe”. In fact, the term chrome and chroming are Australian slang terms for inhalant abuse. A Comic by Vertigo has been released detailing how Immortan Joe came into power. The Comic is entitled: MAD MAX: FURY ROAD: NUX & IMMORTAN JOE #1. I watched the original and was intrigued by Fury Road, but my wife does not enjoy post-apocalyptic or dystopian themes, so we did not see it in theaters. Perhaps one day when I get the chance I will catch it on some platform.